You are buying the Zest Q Petite Nasal Mask With Seal, Cushion, Strap 400444A CPAP, manufactured by Fisher & Paykel. Fisher & Paykel is a leading manufacturer of CPAP Masks and accessories. At ADW Diabetes, we offer the complete product line by Fisher & Paykel with great savings and excellent service. 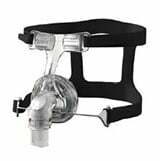 You are buying the Zest Q Petite Nasal Mask With Seal, Cushion, Strap 400444A CPAP, manufactured by Fisher and Paykel. Fisher and Paykel is a leading manufacturer of CPAP Masks and accessories. At ADW Diabetes, we offer the complete product line by Fisher and Paykel with great savings and excellent service. The Zest Q Petite Nasal Mask With Seal, Cushion, Strap 400444A CPAP is fixed with a host of attractive features, such as a FlexiFit cushion, glider strap, innovative air diffuser as well as many others.